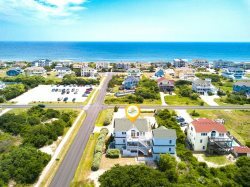 Located just steps from the shoreline of the beautiful beaches of the Outer Banks, Latitude Adjustment is a gorgeous semi-oceanfront vacation rental home situated in the heart of Southern Shores. Tastefully decorated and meticulously cared for by its owners, when you walk inside this 6-bedroom residence you’ll find a wide array of on-site amenities and beachy decor that’s sure to make you feel right at home for your week at the beach. A spacious kitchen with barstool seating for six people joins a large dining room table with room for 10 more. Thanks to Latitude Adjustment’s open floor plan, those spending time in the kitchen and dining areas can also stay connected with family and friends hanging out in the large adjacent living room. With two comfy couches, a set of chairs and a flat-screen TV, you’ll find everything you need to spend quality time with your fellow vacationers—whether you’re whipping up a home-cooked meal, catching a game or watching your favorite movie. When you’re ready to hit the beach for the day, simply walk just 280 feet along the paved pathway that runs along Ocean Boulevard—then use the community beach access that connects the crosswalk to the wide expanse of shoreline on the other side of the sand dunes. Once you reach the beach you’ll find plenty of space to set up your chairs and umbrellas and to spread out your beach blankets, as the beaches of Southern Shores were recently widened and re-nourished in the spring of 2017. Latitude Adjustment also boasts a bubbly hot tub, which is situated just a few feet from the pool so you can relax and unwind after a long day spent enjoying one of the many recreational activities the Outer Banks has to offer—such as surfing, kayaking or standup paddle boarding. When you spend your vacation at this amazing Southern Shores vacation rental home, you won’t have any trouble finding plenty of things to keep your family entertained without ever having to leave the house. In addition to the private pool and hot tub, Latitude Adjustment also has a sand volleyball court, a spot for playing bocce ball and horseshoes, and a game room that comes complete with a kitchenette, sleeper sofa, full-size fridge, foosball table and flat-screen TV. Several large decks wrap around the house, offering an excellent place to soak up the sun and catch an ocean view, or to relax with your favorite book. The wide, paved sidewalk along Ocean Boulevard provides easy access by foot or by bike to the nearby town of Duck to the north, or to the Southern Shores shopping area to the south. Bright and cheerful decor, a private pool and hot tub, ocean views, and quick and easy access to the beach—what more could you ask for on your next Outer Banks vacation? Book your stay at Latitude Adjustment today! Ground-Level: Game room with foosball table and sleeper sofa, 2 master bedrooms with 2 twin beds, and a full bathroom located off the game room that is also accessible from the pool area. Latitude Adjustment was a beautiful home! The views of the ocean and sunset were fabulous. Seaside Vacations had the home cleaned very well. The grocery service was a wonderful opportunity to start our vacation right away. Everything was put in the refrigerator waiting for us. One of our best OBX trips yet!